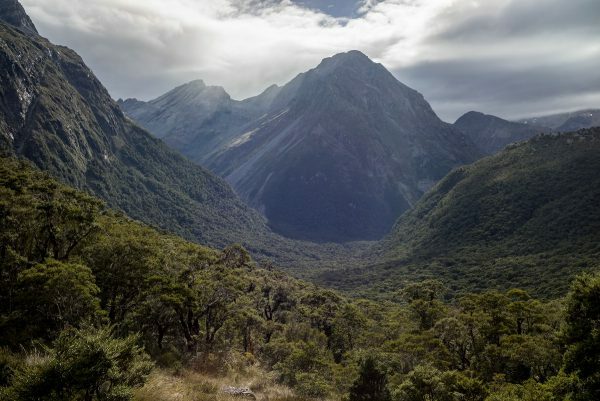 After my hike on the Kepler Track, I had scheduled a hike on Routeburn Track, another Great Walk. As usual, pre-booked accommodation is required, preventing spontaneous trips or adaptation to the weather conditions. 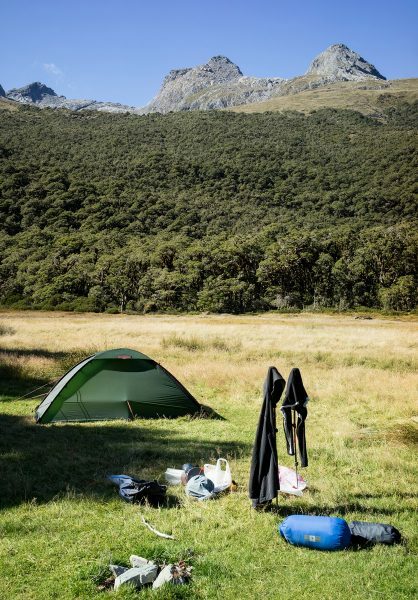 My recommendation, as mentioned before, is opting for camping: you’re more flexible, campsites are less crowded than huts and a lot cheaper. The Routeburn Track starts to the north of Glenorchy which is reachable from Queenstown via the road along Lake Wakatipu. Many hikers book transport back from the track’s endpoint. 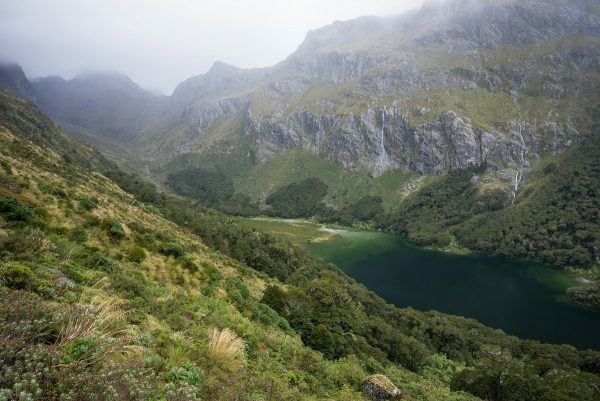 Instead, I wanted to do a loop and take Caples Track back from Lake Howden. This makes for much shorter (and less expensive) transport options and is a great experience by itself. 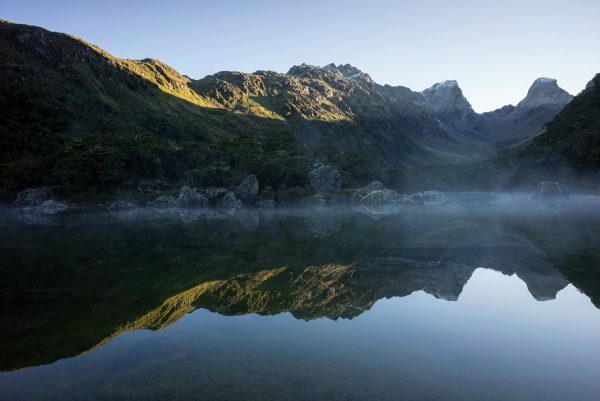 Hut accommodation on Caples Track is not as overpriced as on the Great Walks and camping is permitted anywhere. I didn’t spend a lot of time in Queenstown, the “adventure capital” on the South Island. If you’re into speedboat rides, bungee jumping and other adrenaline sports, it might by worth a longer stop. In Queenstown there are also several companies offering transport to and from trailheads. Most offer online booking as well. 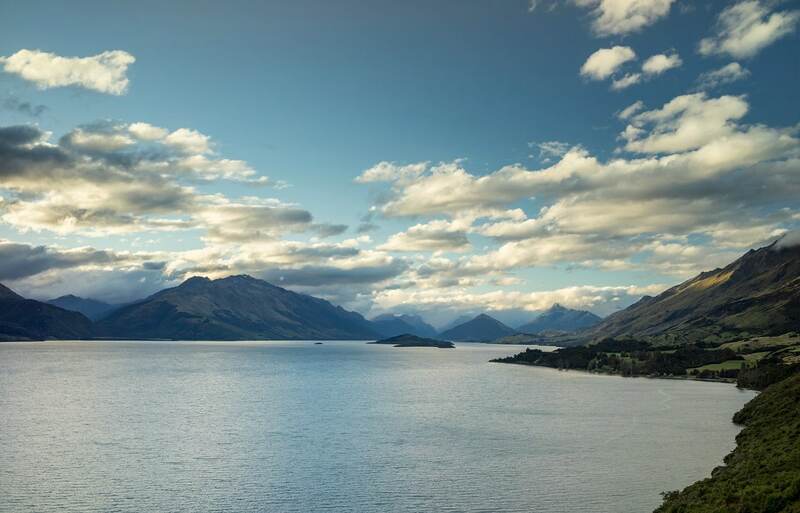 I stocked up on food and continued my trip along the shore towards Glenorchy. Along the road there are several nice viewing points – so be sure to stop here and there. As with all locations that can be easily reached by car, you’re normally not alone. Fortunately, it’s not always as full as in the image below. 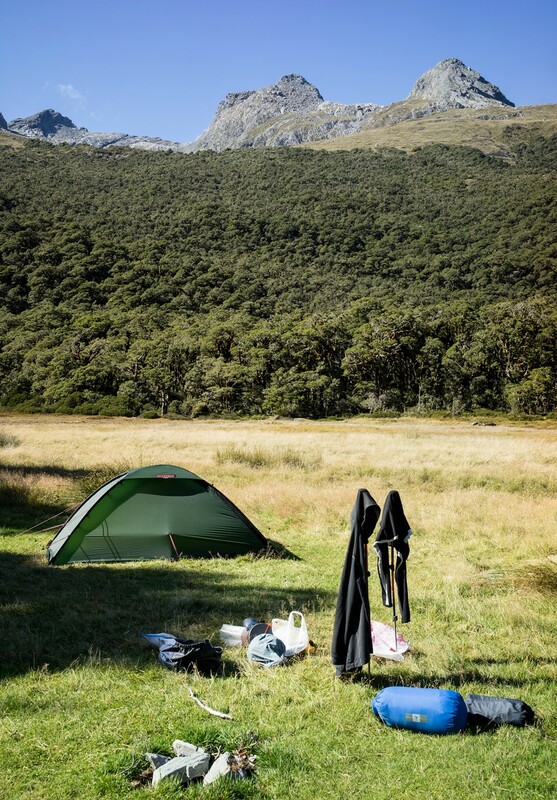 If you’re a camper, you can stay over night at the DOC campsite Twelve Mile Delta a few kilometers from Queenstown. For logistical reasons I spent two nights there. 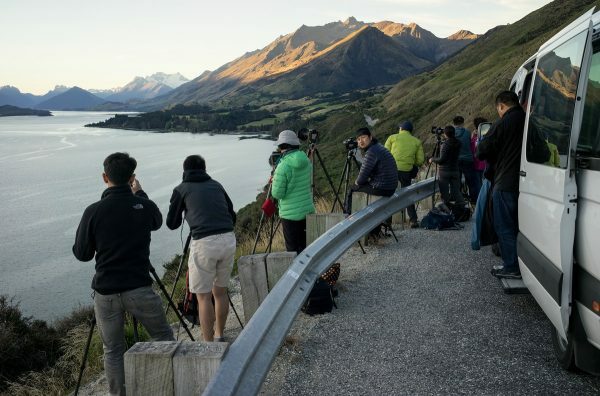 I visited some lookouts along the road in the evening and morning – but didn’t get an image better than the one posted above. A clear sky is a serious problem for a landscape photographer ;-). 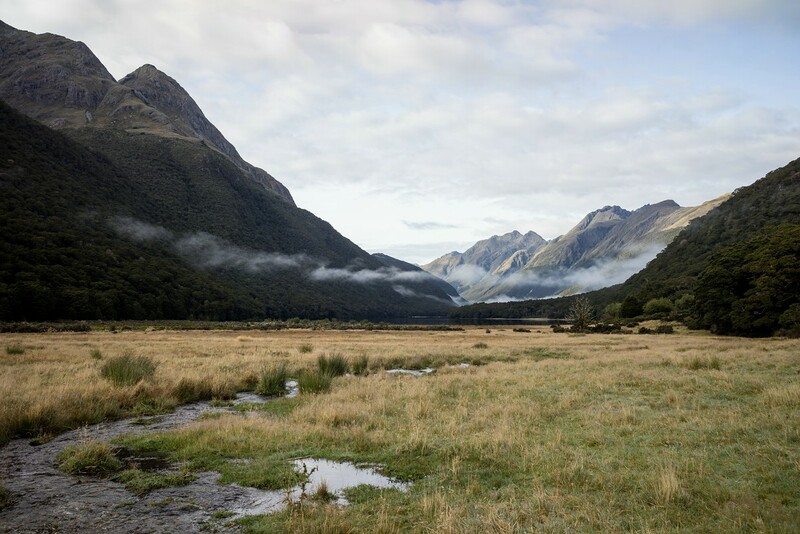 On the second morning I drove to Glenorchy where a small bus would bring me to the Routeburn trailhead. Routeburn track is usually done in three days with a stop at Routeburn Falls and Lake Mackenzie where the main huts are located. However, at Routeburn Falls there is no campsite and thus you need to stop a few kilometers before at Routeburn Flats. This shortens the distance of the first day to 6.5 km. Of course, you could also go directly to Lake Mackenzie Campground/Hut for a total of 20 km. I decided to take the slower option, as I did not want to rush through the landscape but take time off for photography and just enjoying nature. 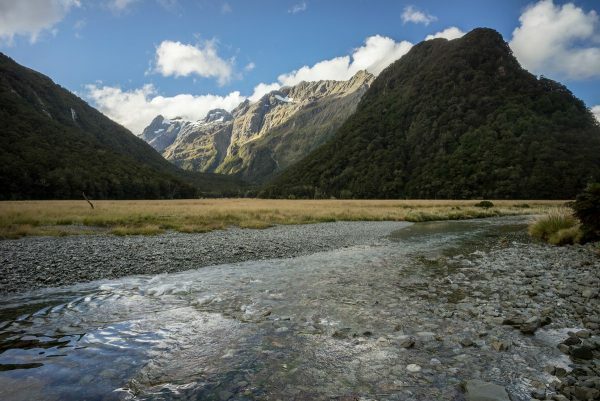 In its ascent to Routeburn Flats the path follows the mountain stream Route Burn. The stream is crystal clear and the water appears to have an intense aquamarine color in the sunlight. The track passes mostly through beech forest but here and there you can get closer to the water for a look. As you can see in the image above, the sky is slowly darkening. 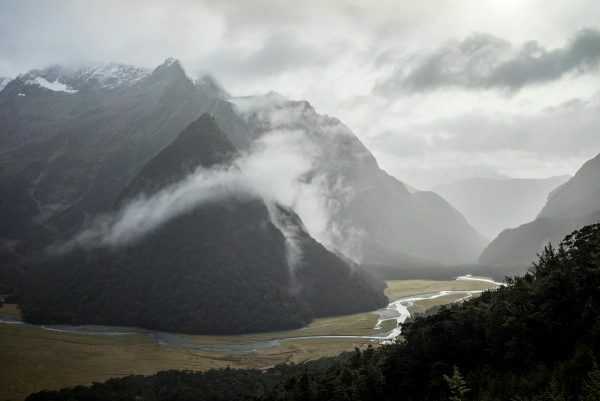 It did not take very long until I reached Routeburn Flats and hurried to pitch my tent as heavy rain was setting in. 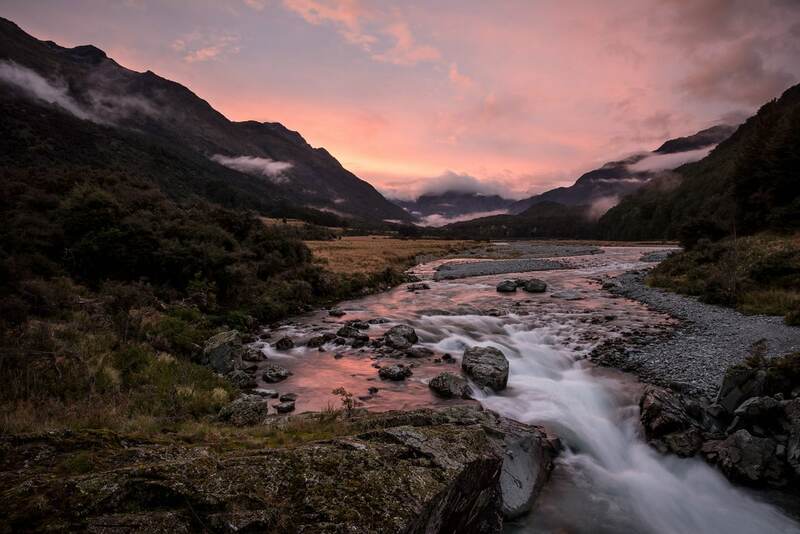 A few hours later, it stopped raining and I decided to walk up to Routeburn Falls Hut to take some pictures along the way. When I arrived at the hut, I checked for the weather forecast. In addition to a lot of rain, the temperature was going to drop significantly the next day. I was disappointed as this was going to be the most spectacular part of the hike. This is one example why pre-booked accommodation robs you of any flexibility: normally I would have decided to sit out the weather and continue my hike afterwards. Back at my tent the sky had cleared up and the sun came through. Unfortunately, it was not going to last very long. The next morning it was raining and cold as expected. I packed my gear and was happy for the small shelter at the campsite – at least one advantage of the Great Walks tourism. 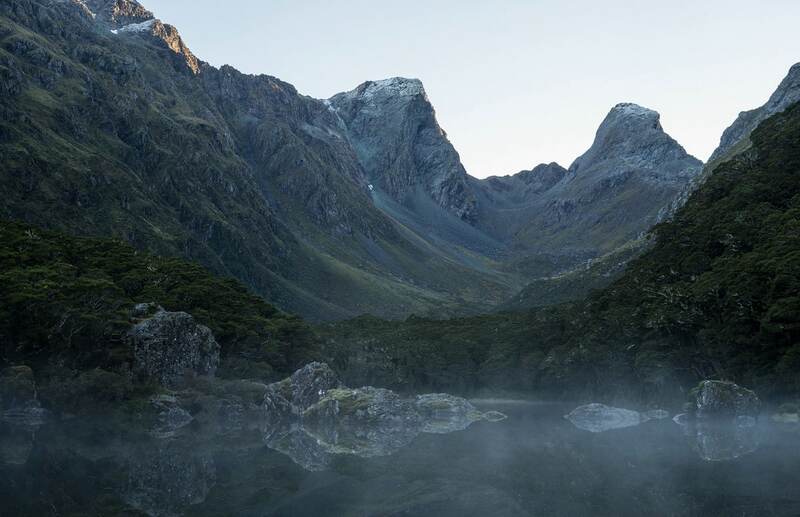 After breakfast I walked up to Routeburn Falls Hut as the afternoon before. This time it was raining the whole time. I briefly stopped for a photo of the scenery – which looked great despite (or because of?) the weather. 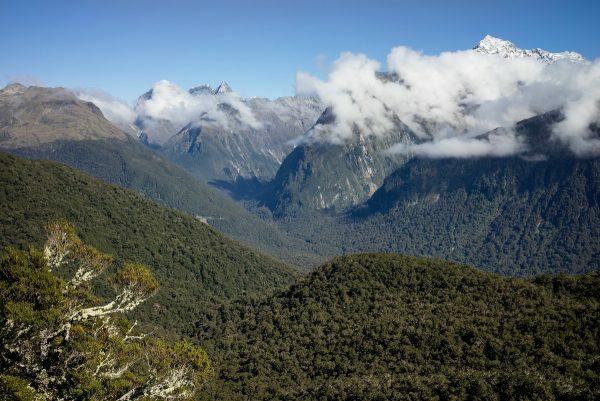 I briefly stopped at Routeburn Falls Hut where a large group of Chinese hikers was about to depart. 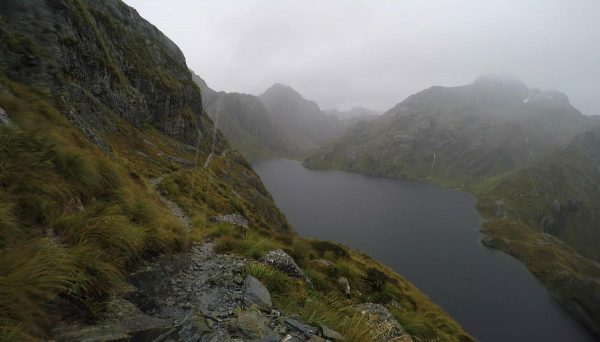 There was no improvement in weather and thus, the views at Harris Saddle and of Lake Harris were disappointing. Nonetheless, there would have been opportunities for some interesting images and I regret not having taken out the camera due to rain and cold. Thus, only some low-quality impressions from my action camera remain. I used the shelter at Harris Saddle to warm up a bit – I was totally soaked and it was very windy. I continued my hike down towards Lake Mackenzie. 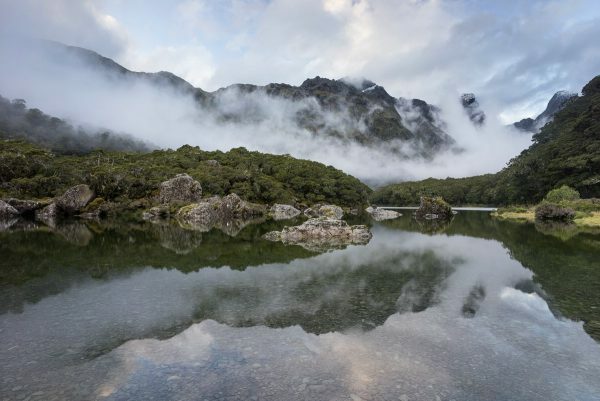 When I reached lower ground the rain slowed to a drizzle and I stopped for a photo of Lake Mackenzie from above. At lake Mackenzie I first set up my tent at the camp site which is located a bit off from the hut (which is great as there are a lot less people). The best view of the lake, however, you can get near the hut. I spend a lot of time in the evening to watch clouds and fog shifting. Fortunately, the rain had stopped. The sky cleared totally during the night which made the temperate drop quite a bit. As often during my trip, I got up early to capture the first glipse of sunlight on the landscape. The sunlight slowly began illuminating the mountains to the west. Due to the dense vegetation around the lake, it proved difficult to get an unobstructed view. Although more spectacular, the view towards the east was more difficult to photograph due to the cloudless sky and back-lit mountains. I imagine, that the light will be much better in the evening – assuming that a bit of sunlight is available. 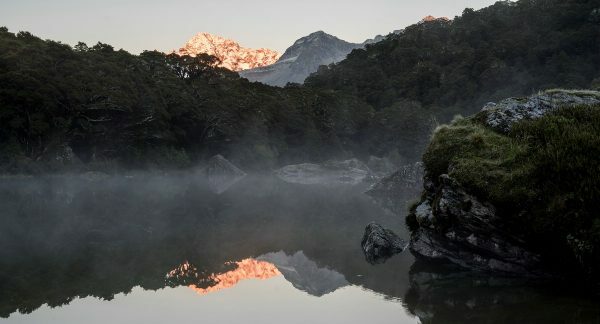 Nevertheless, I think that the mist above the water adds to the image. From Lake Mackenzie the slowly descending trail passes high above Hollyford Valley. The views towards the rugged mountain ranges to the west of the valley are really impressive if you have a clear view. 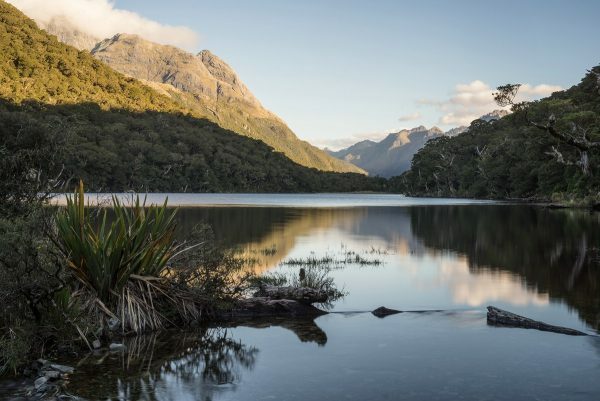 I regretted not having the opportunity to walk back to Harris Saddle and up to Conical Hill to enjoy the view – again due to the pre-booked accomodation; there was no possibility to stay another night at Lake Mackenzie. After some time I passed the 174 m tall Earland Falls. It is difficult to get a good photographic composition at this spot – but it is impressive to see. 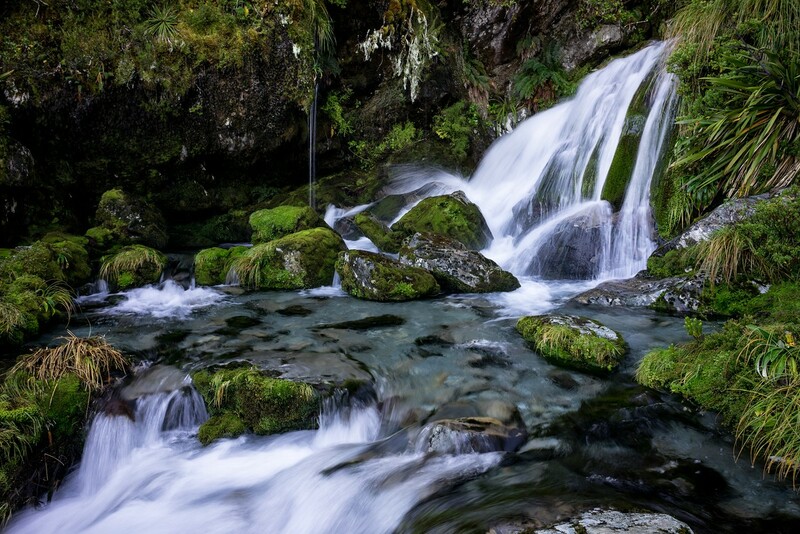 I had more luck at a small cascade of a side-stream crossing the trail. 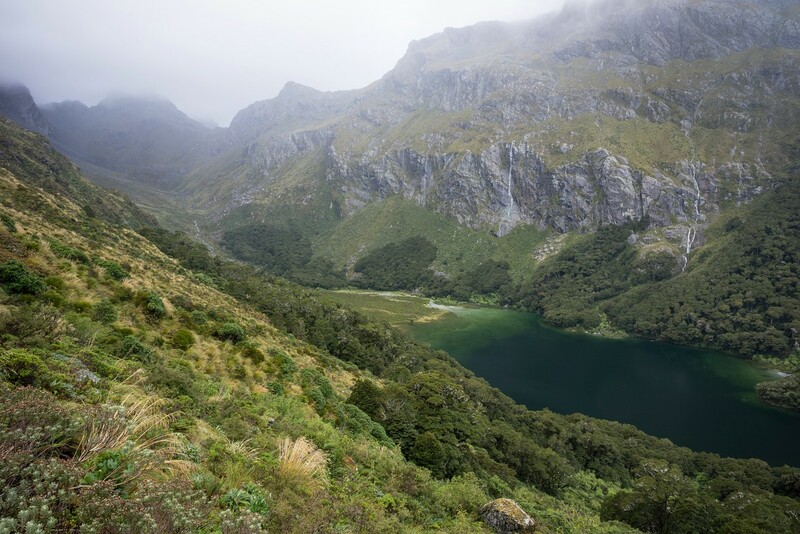 The trail descends to Lake Howden where another hut is located. 30 minutes from the hut there is a free campsite where I decided to spend the night. I pitched my tent and dried my gear in the sun. In the evening I wanted to hike up to Key Summit with my camera only. Key Summit is located at a point where the Eglinton, Hollyford and Greenstone Valleys meet. Thus, it is an interesting viewing point. However, I had hoped to get a less obstructed view to the valley floors. Of course, the scenery is beautiful nonetheless. If I return one day, I will try to get there in the morning as I expect better lighting conditions at that time. In particular, it was interesting to see locations I had visited before from a different perspective – like Lake Marian to the right of the following picture. On the way back I stopped at Lake Howden for a few pictures. The evening light made the scene much more interesting than it had been in the afternoon. At the campsite a few other tents had been pitched, but there was plenty of space left – a contrast to the Great Walk campsites I had slept at before. Caples Track is a two-day walk from Lake Howden to Greenstone Wharf at Lake Wakatipu from where there are bus services to Glenorchy and Queenstown. 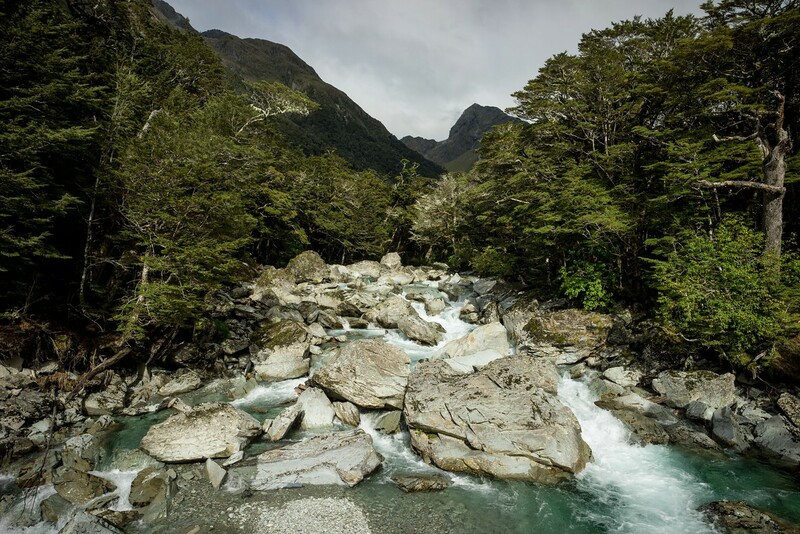 There is also Greenstone Track with the same destination that follows in the parallel Greenstone Valley. The next morning I was greeted with cloudy but dry weather. From the campsite near Lake Howden I followed the Greenstone Valley until the Caples Track branches off to the east. A longer ascent to McKellar Saddle follows. It was evident that the trail had been re-worked resulting in a lot of debris to the sides. While it is now much easier to walk with respect to the descriptions I had read, it has lost some of its appeal. 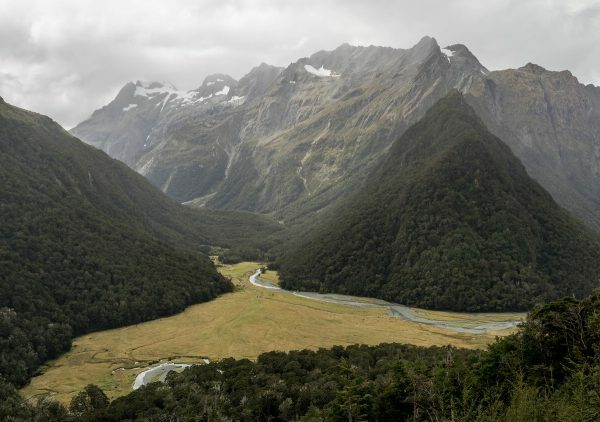 From McKellar Saddle there are views back into Greenstone Valley and later also into the lower Caples Valley. Soon the track enters the forest. For quite a while, only rare glimpses of the surrounding mountains are available. Originally, I had planned to stay in Upper Caples Hut as I wanted to explore the surrounding area further. Unfortunately, it has been closed to the public. At the time of my visit it was occupied by a hunting party. Thus, I continued on towards Mid Caples Hut. 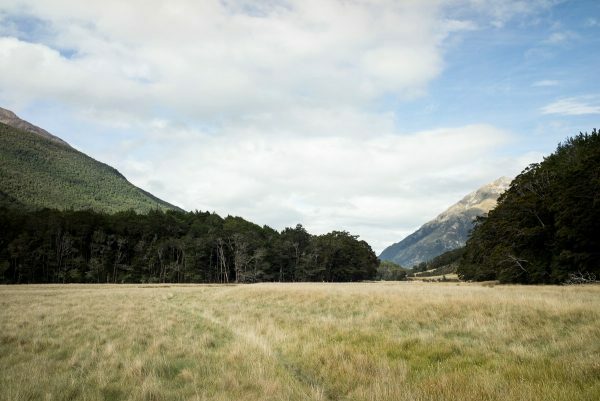 The ground became flatter as the Caples River crosses larger areas of grassland that are in part used for cattle. In the afternoon I stopped at Mid Caples Hut. The hut was occupied by half hikers and hunters which led to interesting small talk. I used some of the remaining time to explore the surrounding area. 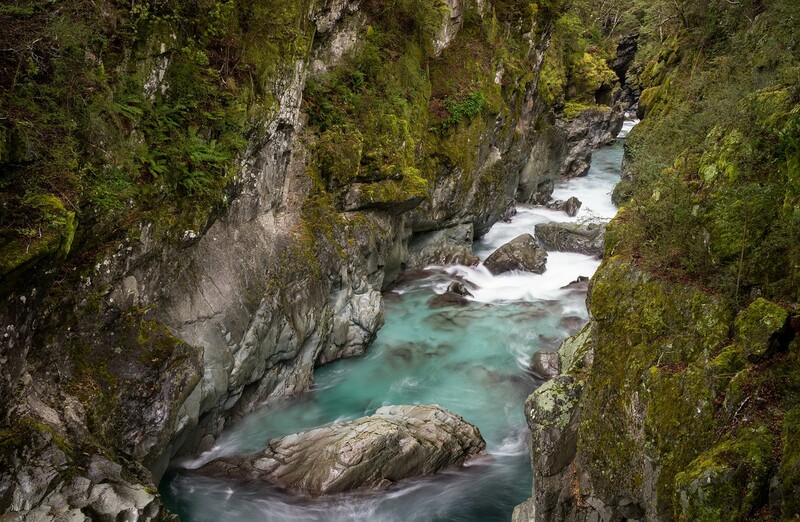 Nearby there is a gorge and the Caples River forms nice cascades on its way down over the rocks. Due to the overcast sky I did not expect a spectacular sunset. As it turned out, I had been wrong. 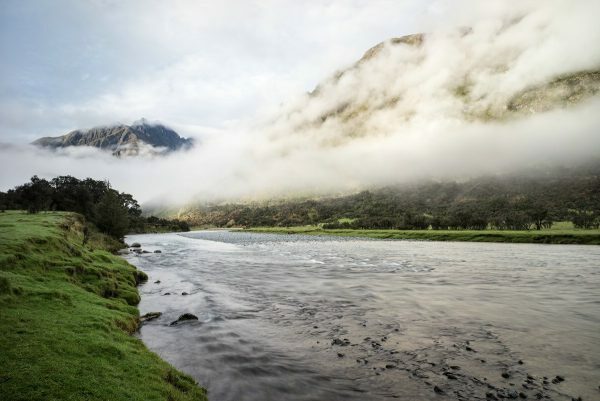 When the clouds started to turn yellow I went down to the river, right above the gorge. The sky changed from yellow to orange to red – it was really impressive. The second day in the Caples Valley started overcast and foggy. I left early as I had a transport arrangement at noon. After some time the cloud cover started to break open and I stopped for some pictures. The rest of the way was an easy walk and soon I arrived at the convergence of the Caples and Greenstone Rivers. 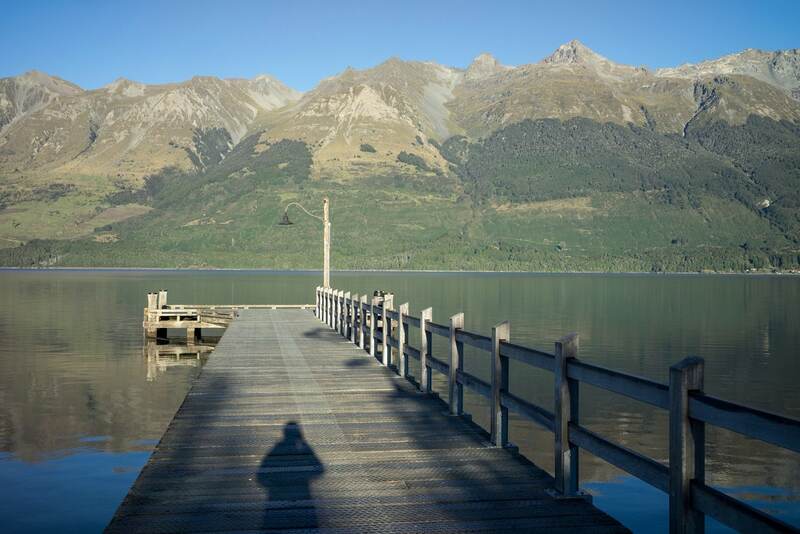 From Greenstone Wharf I got a lift to Glenorchy where I had left my car.